It seems that in boxing 12 months can be a very long time for some fighters, whilst for others it's not long at all. For some 12 months can see them falling from the top of the mountain to being left with the also rans and cast aside as a washed up fighter, for others however a year can be the time it takes for them to go from journeyman to world champion. Although Filipino youngster Rey Loreto (18-13, 10) hasn't quite gone as far as to win one of the "big 4" titles he has had a remarkable 12 months which has encapsulated the idea that a fighter cannot be judged solely by their record or by the past. In fact if anything Loreto has shown that you are as good as your last fight, which in his case would make him very, very good. Just a year ago Rey had an ugly looking record that was barely better than 50-50 (15-12, 8). He was however a man showing great signs of improvement and maturity as he began winning bouts that may have slipped by him earlier in his career. That's not to say he was scoring major wins 2 years ago, but he was scoring wins. A little less than a year ago Rey moved to 16-12 with a decision over Sherwin McDo Lungay, a real journeyman who currently sports a 7-25-2 record. 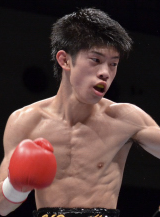 That was Rey's 8th victory in 9 bouts, though only one of them was notable, a stoppage over Wisanu Kokietgym. The victory over Wisanu should have alerted us to the fact that Rey was talented, instead it was put down to a fluke and something that wasn't likely to happen again, after all he had lost his previous 4 to that contest. The past 12 months have proven that Rey's victory over Wisanu was far from a fluke, what it was was the early signs of a fighter with genuine talent and a fighter who was dangerous when given a chance. The last 12 months has seen Rey going 3-1 (2). The victory over McDo Lungary was the first of those wins though it has since been followed by victories over Pornsawan Porpramook, the former WBA Minimumweight champion, and Nkosinathi Joyi, the former IBF Minimumweight champion. Of course people are going to point out the loss Rey has suffered over the past year as a sign that this kid isn't all that. If you however take a look at the loss, it was a technical split decision to a man that Rey had beaten earlier in his career and could well have taken a second victory over had one judge switched just a single round. Rey, who now holds the IBO Light Flyweight title, will be hoping that he shut up the doubters who had called him various things from "title pretender" to a man who effectively suggested he had no right to step foot in the ring with Joyi. Sure Rey doesn't have a great record but he has the skills, power and heart to go a long way in this sport and if this past year proved anything it's that Rey Loreto is a man on the rise and a serious threat to anyone in the Light Flyweight division. For those who missed the fight with Joyi, it can be watched in it's entirety below.